Freddie Frinton was born as Frederic Bittener Coo in Grimsby and he grew up by foster parents as a illegitimate child. He hat to work hard for his living at young age, at 14 he was busy as a packer in a fish factory. Despite these difficult environment he soon called attention to his collegues with his gags and parodies which even cost him his job at the factory. Therefore Freddie Frinton tried to appear as a comedian at different vaudevilles. Not long and he had first successes and his engagements became bigger. When Workd War II broke out he was drafted as well and he became busy as a troup tutor. He continued his career as a comedian successfully after the war and in 1945 he performed together with May Warden the play "Dinner for One" by Lauri Wylie in the Winter Gardens for the first time. This became his parade role later although as a teetotaler he had to play a drunkard. At the end of the 40s followed first smaller roles for movies, to these productions belong "Trouble in the Air" (48), "Penny Points to Paradise" (51), "Forces' Sweetheart" (53) and "Stars in Your Eyes" (57). About 1951 Freddie Frinton bought the rights for "Dinner for One" because till then he had to pay author's fee after each performance and now he was the owner of the play. The 60s marked the height of his career. He played in the successful TV serial "Meet the Wife" (63-66). To his other appearances in front of the camera belong "Make Mine Mink" (60), "What a Whooper" (61), two episodes of ther serial "Comedy Playhouse: The Bed" (63) and "Comedy Playhouse: The Family of Fred" (68). In 1963 the German NDR produced a TV recording of "Dinner for One", directed by Heinz Dunkhase. The salary Frinton and Warden got amounted to DM 4'150.-. Although Freddie Frinton refused to play the sketch in German because of his experiences in World War II the transmission of the scetch was not subtitled and was a huge success. 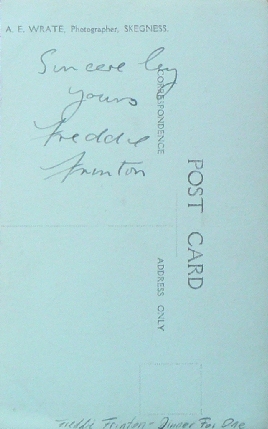 Freddie Frinton worked constantly in the next years, especially at the theater. At the age of on 59 he died surprisingly in 1968. This would normally mean the end of a British comedian who will fell into oblivion for the posterity. But then the German TV version of "Dinner for One" from 1963 became a self-seller and in 1972 it became an evergreen in Germany, Austria and Switzerland. Later followed Scandinavian countries where the play also was successful. Lastly the play also conquered South Africa and Australia. Already in 1988 the TV play was included in the Guiness Book of Records as the worldwide most frequently reran TV production. Till today followed countless more transmissions. Only in 2003 the scetch was shown 19 times in Germany.